Tip: Add broccoli slaw for extra crunch. Ginger Slaw and Nutrient Rich Black Bean Soup from Unprocessed: How to Achieve Vibrant Health and Your Ideal Weight, by Chef AJ. Details on how to enter the giveaway are below. Tip: Top with chopped tomatoes, avocado and red onion. To enter the giveaway, please leave a comment below or on any other Unprocessed blog post describing what you find most addicting: sugar, salt or fat. Or, share your story of how you have cleaned up your diet and changed your life. For additional entries you can also Like my Facebook pages, An Unrefined Vegan and/or Virtual Vegan Potluck. Tomorrow is the last day to enter the giveaway! I think the stroganoff. It is so creamy…very comforting. Sweeeeeet! Let me know how you dressed ’em up! Change of plans, but I need to use up the portobellas so it’s soon! Just beautiful. Love me some black bean soup, although the kids won’t go near it. The color I think. Now I really want some…. Yeah, the color isn’t the most appealing thing about black bean soup – there’s a murkiness that’s unsettling. But a good black bean soup…well, it’s pure happiness. Agreed. And murkiness is JUST the right word. LOL. Actually, if I put it that way, I might be able to get them to eat it. Weird little creatures. 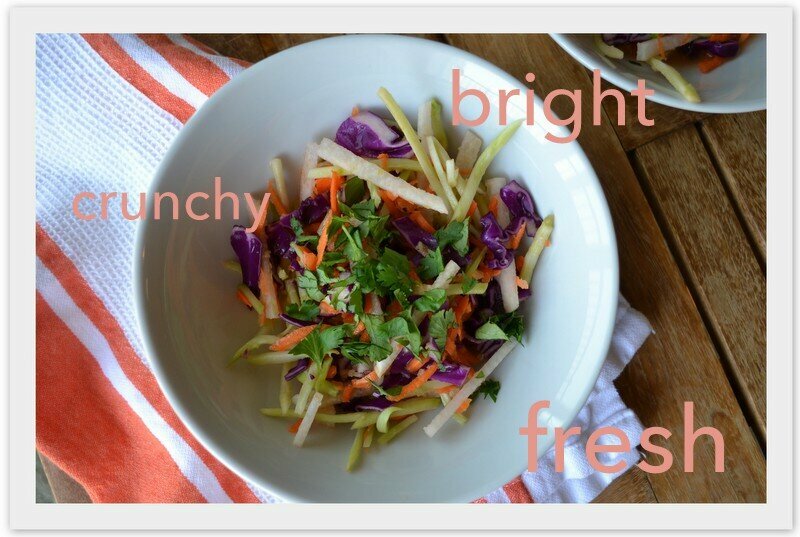 I’m very taken with the idea of the ginger slaw, it looks so crunchy and delicious! I could just eat some of that now, a lovely thing to munch on. As I look out of the window here the rain is pelting down with gale force winds whipping it against the window, and that soup looks very comforting and cosy. Oh my, Lorna! Sounds like a very fall day for you! I must admit, I kind of envy you your storm. I’m sure we’ll have them soon enough here, but something about a warm bowl of soup, a cup of tea, settling inside to watch the rain come down. Nice. I lovee broccoli slaw!! The addition of ginger makes it even better! I love the contrast of light and hearty yet both dishes look healthy and delicious. Nice work 🙂 I’d say my weakness have always been salty food-plus fatty food. The dynamic duo of salt and fat ;-)! *look equally healthy and delicious. Hi Shira!! Seems like sugar is the downfall for the majority of those who have commented. Definitely moderation and…those moments. I have never tried black bean soup – I am sure it would be perfect on a cold and rainy day. Oh you’ve got to try it! So very comforting. Sugar is my nemesis. It has been since I was a little kid when my parents wouldn’t let me eat it and I snuck it into the house and hid it all over my room like Claudia in “The Babysitter’s Club” series. I know, ridiculous. And my Aunt still vividly remembers the dreadful day when she thought it was a good idea to give me a Coke- at age 3! As she describes it, she needed a spatula to scrape me off the ceiling. Then a few weeks ago I went alkaline and woohoo, no more! Not kidding. Tonight the cantaloupe we ate with dinner was too sweet for me. Go figure. That is awesome, Erika! I assume it’s been a tremendous help with your migraines?